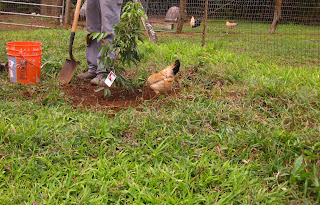 Getting a few pointers for properly planting fruit trees. 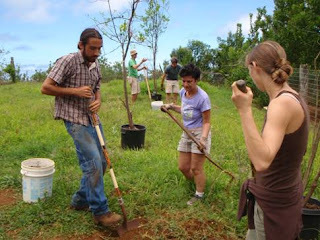 This past Thursday John and I stopped by Leilani Farm Sanctuary to help plant about 30 trees which were donated by Orchards for Animals. 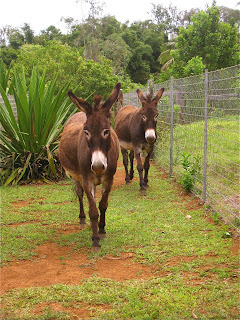 The Fruit Tree Planting Foundation (FTPF) program “Orchards for Animals” was developed to help sanctuaries with rescued animals. The trees will provide the animals with nutritious forage, shelter and shade. These types of organizations rely on volunteers and we were all too happy to lend a few hours. Some of the varieties planted were: lemon, orange, tangerine, banana, mango, avocado, lychee, mulberry and papaya. 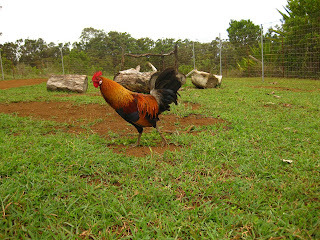 Kekoa was a no show, but we did hear a pheasant in the background while we were there? Was it him. Who can say. Until we actually see him we cannot be for sure. Here are a few snaps of the residents and a few volunteers. 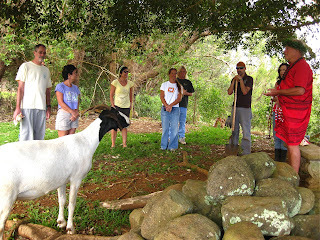 Barry leading a traditional Hawaiian blessing of the orchard for the animals. Ned the goat is very interested by what he hears. Planting a row of citrus. Yep, there we are in the background. That's me inspecting a branch on the tangerine. 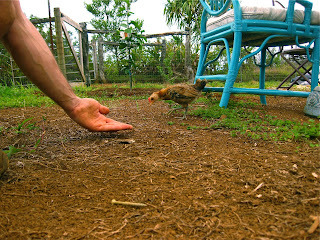 Lovie Bird the hen immediately started digging in the fresh dug dirt around each tree. 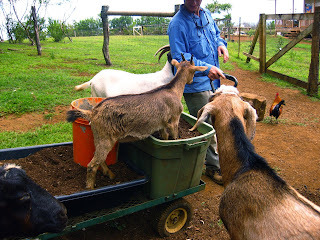 We filled container after container with compost and manure to place around the planted trees and Penny could not resist a free ride. We finally got to meet Jenny and Lehua. Both adorable and so sweet. I loved those gimormous ears which were covered in the softest fur. I forget this handsome creatures name. But he's really sweet. 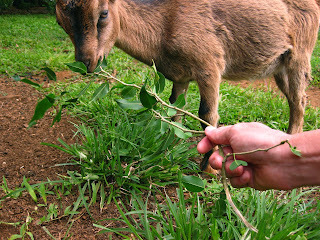 Here I am feeding Penny a ficus branch. 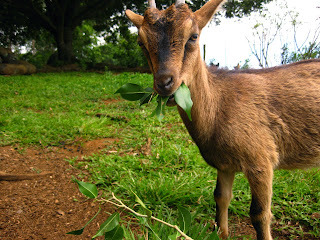 The goats love them but cannot reach them. Unless that is they are pulled down low enough for them to nibble on. 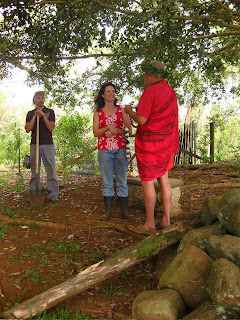 Maybe Leilani Farm can adopt me. I don't shed and have been housebroken for years, so Laurelee wouldn't have anything to worry about. That Ned the goat at the blessing is cracking me UP! What a special place indeed. . .Kekoa must be loving life there. Hope there is a sighting soon. OH DEAR! Please excuse all my spelling errors in this earlier post. I was cross-eyed and falling asleep as I typed it out. I think I caught them all.